As Ofsted inspectors deliver a critical verdict of the education prisoners receive in England's jails, one ex-inmate describes how he finally learnt a vital lesson. Expelled from school at 12, Frank Harris says it was the thought of how he would be remembered by his own children that helped him see education as a way to change his life. The 53-year-old Londoner says he was in and out of prisons for more than 30 years before he found his "way out" through education and wants other people involved in crime to see it is not too late for them either. "If they said I was in and out of prison - that I wasted my time on earth. Now they can say I made mistakes, but I tried to do something different. That pushes me on. "I'm still enjoying my education and still have something to give back." Frank is in the second year of a degree in criminology and criminal justice. He counsels and mentors others who have been involved in crime and has worked with the police on tackling gang culture. But in 2004 he was facing his longest prison stretch ever - four years for smuggling cocaine from Amsterdam - after what he says was a "lifetime of crime". "I knew I'd be coming out, that I needed to do something, to make a change instead of hanging around with people," he said. "I found I enjoyed learning. I had been interested before in lots of things but never had the kind of environment for it to be cool to learn." 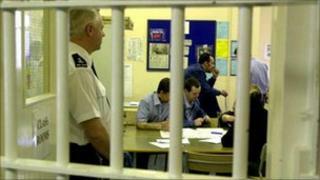 In prison, he did basic skills lessons before getting A-grades in GCSE English and maths. People were getting shot in a car next to me; people getting stabbed. Now I am a proper father, a proper son, a proper grandfather. "People saying well done, that inspired me to say I enjoyed doing this education and it was positive. I saw I could change my life, learning and achieving things. I saw education as a way out and that it could be the key to set me free." After leaving jail, Frank says he was very tempted to go back to his old way of life but instead decided to stay in touch with a charity that had supported him inside - the Prisoners' Education Trust - and the St Giles Trust. "Normally, I was getting picked up by one of my friends [when I got out of jail], and before I got back to London, I would be stoned and wouldn't get home for two days. "The crucial thing this time was there was link. This group had offices you can get in touch with when you get out." Frank says he was on the verge of getting involved with crime again when, he says: "Something told me, 'Don't take the left path, take a right,' and instead, I went down to the offices." He went on take a qualification in counselling to help homeless and vulnerable people and to work for the charity Turning Point. He now counsels others, he says, "to try to stop them taking my path". Like many people in Britain's jails, Frank did badly at school. He had no academic qualifications before studying in prison in his 40s. Expelled at 12, he says he was "delinquent" for 18 months, before being sent to a reform "boarding school", where he says there was no proper teaching. "Boys would be banging about while others were doing written work." Frank says things then went further downhill. "I'd come home every two weeks - my family would not know me, I had no friends. I'd go around by myself and began breaking in to cars, doing rubbish stuff because I was lonely, bored." Shortly after that, Frank says, he began to get custodial sentences for theft and fraud and "that was it for 30 years". He says he was never involved with violent or sexual crimes, but witnessed violence. "People were getting shot in a car next to me; people getting stabbed, but I never picked up a knife in anger. I was smoking crack but I always felt I was on the outside looking in; like I was not meant to be there. "Now I know that reason was to say to young men and women, 'You don't have to go that way - it's such a waste.' I'm here to tell that story. "If you find yourself on the that road, if you are in prison, there's a way out and it's education. "Now I'm a proper father, a proper son, a proper grandfather. I'm stable and I have a family that's stable."